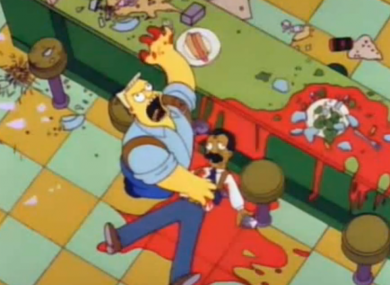 Someone’s strung together the McBain clips from the Simpsons – and they make a film, with a proper plot and storyline! THE SIMPSONS had been planning a movie long before they finally released the actual Simpsons Movie in 2007 – famously, Fox had wanted the show to turn the ‘Kamp Krusty’ episode into a full-length feature, though the writers said they couldn’t come up with enough plot to justify it. But now, as it turns out, there was a Simpsons movie years ago – featuring Rainier Wolfcastle’s McBain character and his exploits in trying to crush the drug ring of the evil Senator Mendoza. Amazingly – despite being spread across a number of episodes and even across series – the various clips of the McBain movies dropped into episodes all make a totally (well, almost) cohesive plot when they’re strung together. We wonder, though, whether the promised sequel (‘You Have The Right To Remain Dead’) to this Schwarzenegger-Bond lovechild will ever come to pass. Edit: Hat tip to Collegehumor who appear to have strung the clips together. Email “McBain: the Simpsons movie you never knew about”. Feedback on “McBain: the Simpsons movie you never knew about”.